Tenerife is a volcanic island dominated by snow-capped Teide volcano (3718 meters; 12,198 feet). Teide is classified as an active volcano and there have been eruptions during this century, but this has not inhibited the massive development of tourism on the island, with Teide as a major attraction. (There is a cable car to its summit.) Tenerife exhibits the steep lava cliffs typical of an active and “growing” volcano, geologically speaking. The white surf line can be seen pounding the cliffs on the northwest coast facing the prevailing winds. The combination of cliffs and volcanic lava and ash do not make for good tourist beaches. To serve the requirements of the expanding tourism industry, artificial beaches have been constructed with imported sand. 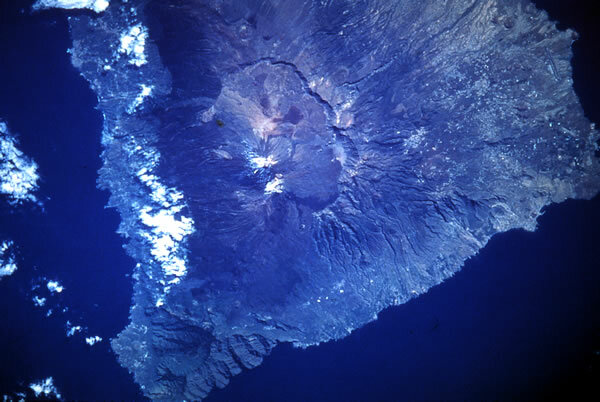 The steep walls of the large central volcanic caldera are clearly visible and smaller circular craters related to individual, smaller volcanic events can be seen within the caldera. An additional vent can be seen on the upper flanks of the volcano to the east of the main caldera. South of the main caldera rim, the flanks of the volcano are covered by thick pyroclastic flow and fall deposits that extend as far as the coast. These have been studied to determine the history of explosive eruptions on Tenerife and indicate that major eruptions occur every few thousand years. STS-41C, April 1983. Picture #13-35-1472.